If you are looking for an easy but SUPER tasty side dish that you can make for dinner then this slow cooker mashed potato recipe is perfect. 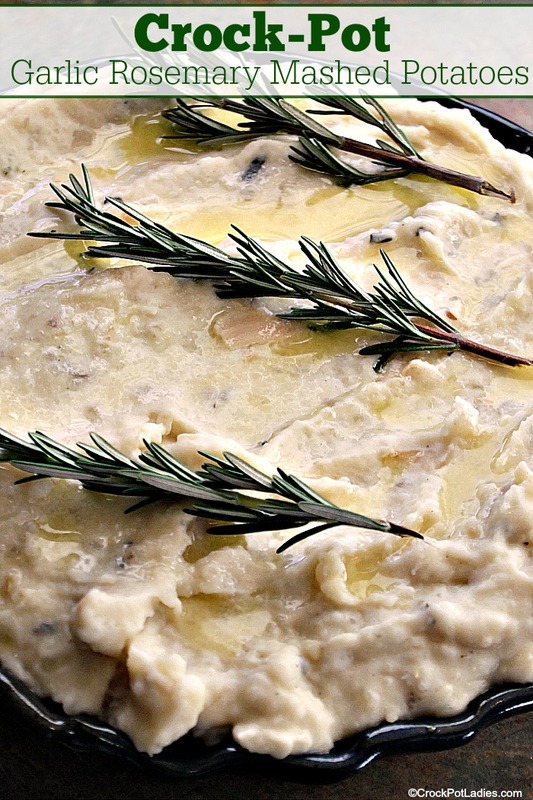 Loaded with roasted garlic that is cooked right in with the potatoes and fresh rosemary there is a ton of flavor. 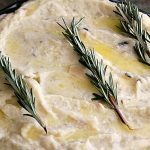 Cream cheese, butter and half and half cream add add richness and creaminess that is over the top and best of all..you it is all made right in your slow cooker! I don’t know why, but whenever I make traditional stove-top mashed potatoes I always end up with the pot of boiling water and potatoes boiling over and creating a huge mess. And then you have to carefully drain the hot potatoes in a colander which is not fun. Not so with this recipe, the peeled and cut up potatoes and only 1 cup of water go in the slow cooker along with a bunch of fresh garlic and rosemary and you just walk away and let everything cook for hours. Then come back when the potatoes are nice and tender and mash everything right in the slow cooker with a potato masher. Add some butter, cream cheese and half and half and season just to your liking with salt and pepper and you have some FANTASTIC mashed potatoes! My husband is a huge garlic fan and I had to swat him away from these potatoes as they were cooking because he kept trying to pluck the roasted garlic out to eat it. These potatoes are easy enough to serve as a side dish at your weekly family dinners but fancy enough for any holiday meal too. And if 10 servings is a bit too much feel free to cut the recipe in half or what I like to do is freeze extra mashed potatoes in freezer bags and just warm them up as needed. I usually have to add a little milk when I warm them up to make them creamy again but it is super easy! 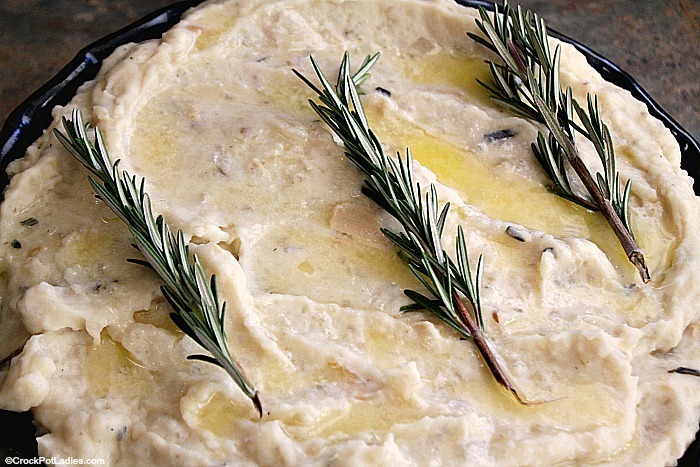 Fresh rosemary and garlic add a ton of great flavor to these mashed potatoes made easy in the slow cooker. Add water, garlic cloves, peeled and cubed potatoes, water, pats of butter, chopped rosemary and 1 teaspoon kosher salt to bottom of a 5 quart or larger slow cooker. Cover and cook on LOW for 6 to 8 hours or on HIGH for 3 to 4 hours until potatoes are tender when pierced with a fork. 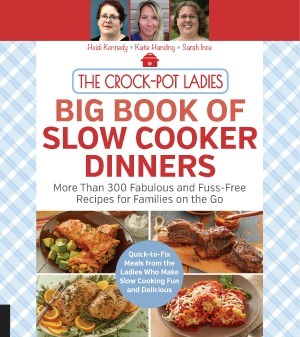 Turn off slow cooker and set lid aside and let potatoes cool in slow cooker for 5 minutes. Mash potatoes with a potato masher right in the slow cooker until the potatoes are mostly mashed. Add half and half and cream cheese and continue to mash until the desired consistency is reached. Taste and add additional salt and pepper as needed. Transfer mashed potatoes to a serving bowl or serve straight from the slow cooker by turning the temperature down to WARM for up to 3 hours. Garnishing the top of the potatoes with fresh rosemary sprigs if desired.